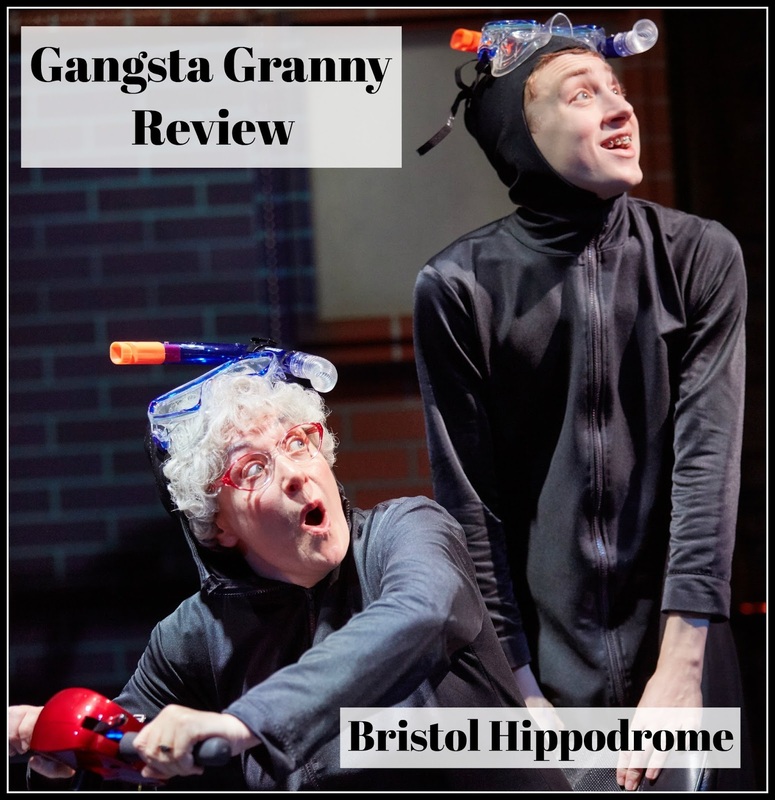 We were absolutely thrilled to be asked to review Gangsta Granny, the stage adaptation of David Walliams' fantastic book. We love going to the theatre and, having read all the David Walliams books, L couldn't wait to see how it transferred to the stage. I wasn't worried about a children's show being less appealing for the grown ups. Walliams has proven to be a visual comic genius and there is no way he was going to let us down in the laugh department. I was not disappointed and neither was L. He was absolutely transfixed for the whole two hours and so was every other child in the nearly full theatre. So, how can I tell you how brilliant it was, without giving away any spoilers, for those of you that have managed not to read the book? Well, there were farts. Many, many farts. It's all the cabbage you see. That's not giving too much away, everyone knows a granny loves her cabbage. Where there are farts though, there will always be an audience of children roaring with laughter. Farts are hilarious, particularly when wafting from the posterior of those from whom you wouldn't expect it. That's comedy gold to a child. Personally, my favourite comedy moments involved the really subtle bright red mobility scooter. No amount of Road Wars episodes can prepare you for the sight of a getaway vehicle with a maximum speed of about four miles per hour pootling across the stage! One of my favourite aspects about the theatre, because I am a bit odd, is the scene changes. I am really keen to find out how the scenery will transform, and what feats of engineering and magic it will take to make it happen. L was fascinated with the scene changes during Gangsta Granny. It was almost a show in itself seeing how they transformed a bedroom into a motorway, or a granny's kitchen into a crime scene! There was a ballroom dancing theme throughout and the glitz and choreography added another dimension to keep the attention of the young audience. By the end, L was pretty much leaping out of his seat with excitement and booing the bad guys! As with all successful comedies, Gangsta Granny has the power to have you howling with laughter one moment, and moved to tears the next. There were some touching scenes in the show and I was pleased to see the production using its thought-provoking subject to support Age UK, in particular Age UK Camden. The show makes some pertinent points about appreciating our elderly and I felt it was both appropriate and inspired to get behind such a worthwhile charity in the wake of the success of the show. There are lots of twists and surprises throughout the show and even after reading the book and seeing the film, I was still really entertained for the duration of the show. I tend to rate the quality of entertainment by how often I look at my watch and I can honestly say, I didn't. Not even once. I felt the length of the performance was absolutely spot on and it really showed how right they got it, because even the very youngest members of the audience were able to sit pretty impressively still for the duration. The theatre is a really wonderful medium to introduce to a child and I think it's brilliant to have a charming, funny, and fast-paced show such as this, to awaken a love of performance and drama in children. L was certainly feeling very inspired by the time we left and he is already excited about the next David Walliams theatre production, Awful Auntie. 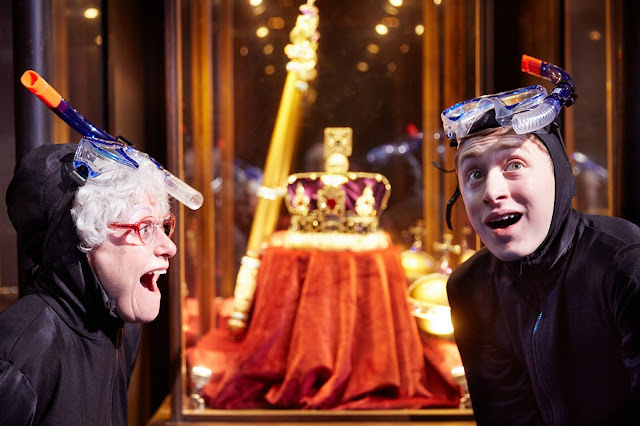 Gangsta Granny is performed by the hugely talented Birmingham Theatre Company, who also produced Horrible Histories. The tour is at the Bristol Hippodrome until Saturday 3rd of June and then continues around the country, delighting audiences all over, undoubtedly. You can find details of further dates and locations at the Birmingham Stage website. This show is a triumph of comedy and truth that I would recommend to anyone with children of 12 or under. 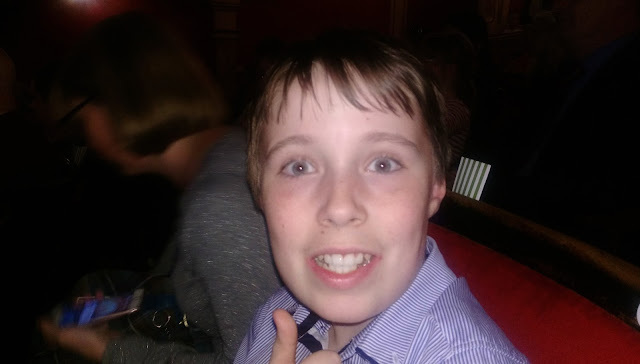 Here is L awaiting the start of the show, with much excitement! We were gifted the tickets, in return for this honest review. I hope it is useful to you. Great review. My three boys, aged 8 to 13, thoroughly enjoyed it too. Oh how fun! I think theatre is such a great thing to introduce children to. It looks like you had a lovely time. Fab review Lucy! Sounds like a great show! Ive heard so much about the book that we keep meaning to get it to read with the girls! Great review! Sounds like a fab show. Would love to see it. Oh wow that sounds great. I really want to take my little ones to go and see this too. This would be so much fun to see, I know my 3 kids would ALL love it! Great review! Sounds like a great show for family. Oh I'm glad you enjoyed it! We are going on Wednesday and I cant wait! !